No matter how simple the balloon, it is always fun to see the shapes emerge from one long “sausage”. Magically, it turns into a dog, a cat, a mouse, a rabbit, a fish, a teddy bear, a lion, a tiger, a kangaroo, a dinosaur… and the more balloons you add the bigger and better the finished result, whether it’s a clown, alien, flower, butterfly, aeroplane or helicopter. However, sometimes a balloon sword is more fun than any of these! 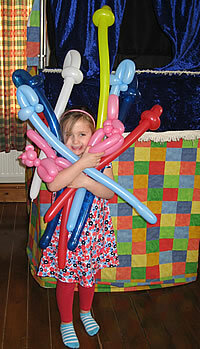 Balloon models can be made for each child and make a wonderful and colourful addition to the party bag. They are also ideal for handing out at fetes and festivals, often between Punch and Judy shows.